The Daniel Meadows Archive was acquired by the Bodleian Library at the University of Oxford in March 2018. Assembled over nearly five decades the archive contains my life's work — all the negatives and contact sheets associated with my photo-documentary work also a great many contextualising documents including posters, magazines, books, receipts, newsletters, notebooks, diaries, audio tapes, digital stories, my PhD document and research material, and much correspondence besides. Housed in the Bodleian's Weston Library on the corner of Broad Street and Parks Road, accessioning is currently underway with its catalogue being mapped onto the Bodleian's own so that, from 2019, it can be made available online. 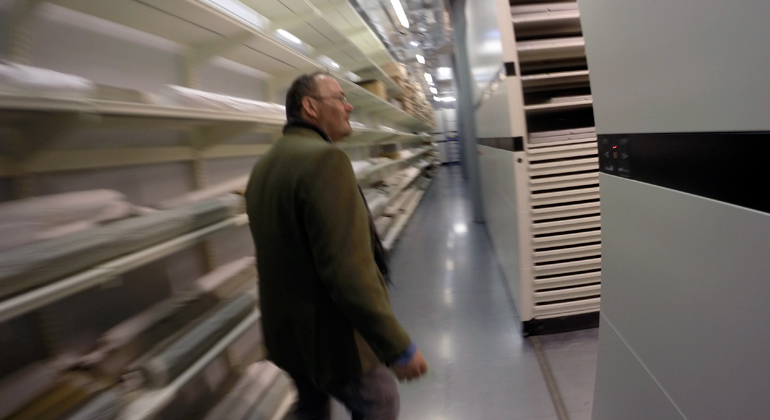 Whilst being catalogued my archive was subjected to a process of scrutiny led by Pete James, Curator of Photography Collections at the Library of Birmingham, and Prof. Val Williams of the Photography and the Archive Research Centre at the University of the Arts London. 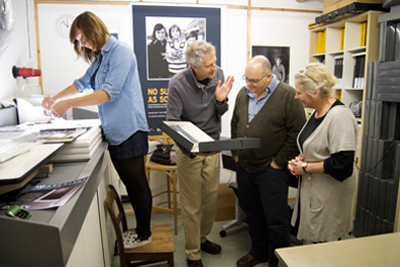 With Kelly Bishop (University of South Wales intern), Pete James and Val Williams studying archive material in my darkroom, 2009. Picture: Paul Reas. For four years (2014-18) the Daniel Meadows Archive was in the holdings of the Library of Birmingham. However, following the hiatus there (see blog article Another One Bites The Dust by Francis Hodgson, Professor in the Culture of Photography at the University of Brighton and Financial Times writer) it was acquired by The Bodleian and transferred to Oxford. r/t: 5 min, 13 sec. In 1973, when studying at Manchester Poly, I teamed up with Martin Parr to photograph the residents of a Salford street. In making this movie (2012) I drew heavily on material in my archive, now in the Bodleian Library, Oxford.